The HTTP dialog applies only if you are installing from an HTTP server (that is, if you used the askmethod boot option and selected HTTP in the Installation Method dialog). 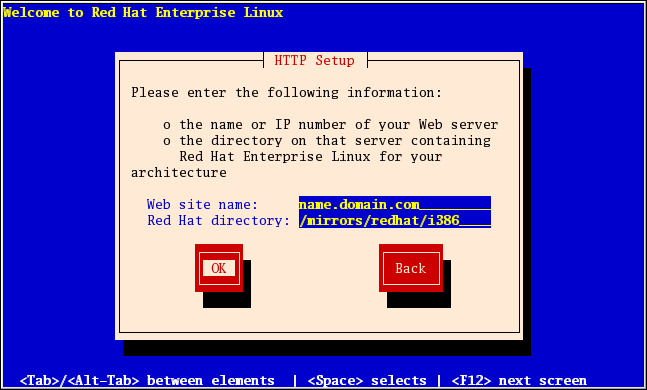 This dialog prompts you for information about the HTTP server from which you are installing Red Hat Enterprise Linux. If you used the repo=http boot option, you already specified a server and path. Enter the name or IP address of the HTTP site you are installing from, and the name of the directory containing the variant/ directory for your architecture. For example, if the HTTP site contains the directory /mirrors/redhat/arch/variant/, enter /mirrors/redhat/arch/ (where arch is replaced with the architecture type of your system, such as i386, ia64, ppc, or s390x, and variant is the variant that you are installing, such as Client, Server, Workstation, etc.). If everything was specified properly, a message box appears indicating that files are being retrieved from the server. Next, the Welcome dialog appears. Replace X with the corresponding disc number.